For the most part, e-newsletters are a great way to keep up to date with the organizations, products and sales that are of interest to you. But sometimes you end up subscribed to an e-newsletter that is simply spam and doesn't offer an easy way to opt out. 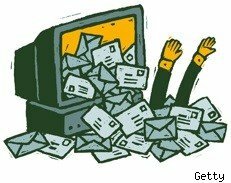 Instead of letting those newsletter pile up, here's how to quickly keep unwanted e-newsletters and spam out of your inbox. While legitimate e-newsletters are required to have an unsubscribe function built in, the unsavory and unsolicited ones will often hide this link, keep the unsubscribe option behind a password-protected area or worse yet, ask you for your name and e-mail address again in order to verify that the e-mail address is a good one to spam. That last scenario happened to WalletPop's Lou Carlozo recently with a newsletter from "Bid Bananas." When he tried to unsubscribe the service wanted to know more about him and even after unsubscribing three times he's still getting the e-mails. Here's a quick way to stop this type of spam without the need to deal with what Lou calls a "sham unsubscribe." The good news is that you can easily use the built-in tools in Gmail, Outlook and other email services to banish this unwanted email to the trash. We're going to cover how to automatically delete spam in Gmail and in Outlook 2010 so that you don't have to waste time with sham unsubscribe pages. 1. Open the message you want to automatically send to the trash. 2. Click on the small arrow in the right hand corner of your message (shown below) and click "Filter messages like this." 3. The next screen will show the e-mail address that the spam came from. If you want you can shorten it to everything after the "@" symbol so that you never get any email from that website, but make sure you don't do that if you get other e-mail you want from that organization. 4. Click next step and tell Gmail what you want to automatically do. In this case you want to check the "Delete it" option. 5. 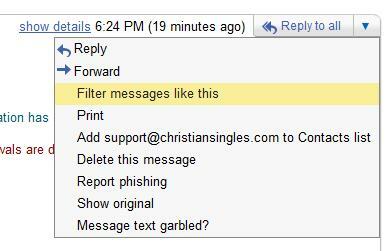 Click "Create Filter" and you'll no longer see any of these messages in your inbox. 1. In Outlook right click on your message and choose "Block Sender" as shown below. That last one happened to WalletPop's Lou Carlozo recently with a newsletter from "Bid Bananas." When he tried to unsubscribe the service wanted to know more about him and even after unsubscribing three times he's still getting the e-mails. Because we like Lou, and we like our readers, we wanted to show you a quick way to stop this type of spam without the need to deal with what Lou calls a "sham unsubscribe." 2. You're done. You won't get e-mail from that address again. If you need to block an entire website this guide will show you how to set up a rule to do that. 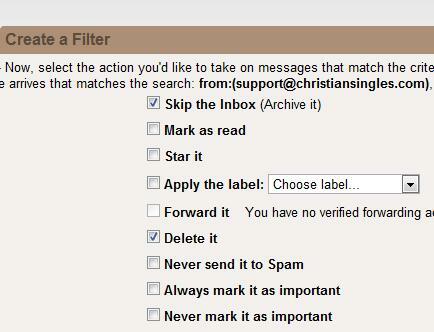 If you use a different e-mail tool you should be able to follow a similar set of steps to set up spam filters. 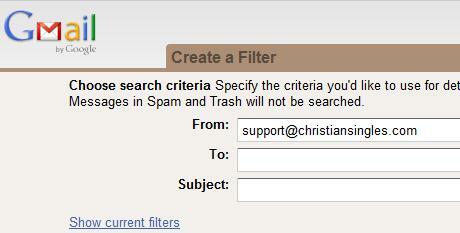 Look for a rules or filters settings or search of the name of your e-mail service and the word filter. Using filters and rules to deal with unwanted e-mail is much safer than unsubscribing to shady e-mails, especially when the website asks for more information. While most legit companies respect your wishes, unscrupulous companies and spammers simply use the unsubscribe option to verify that your e-mail address is working and ripe for more spam.